At a mass-market auto show in America, it’s pretty difficult to find anything that’s genuinely weird in the ways I tend to like: small, strange, slow, and ideally with peculiar engineering. Happily, down in the basement, I found something that came close enough, and took it for a spin: a funny little concept car from, of all places, Shell, the oil company. 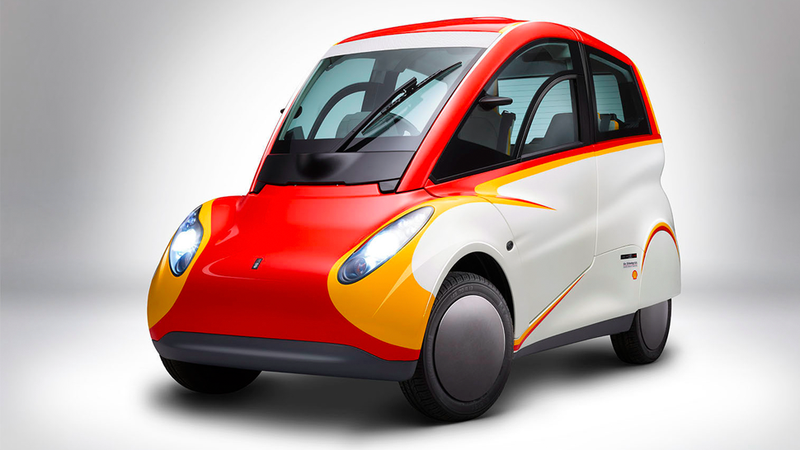 The little 660cc three-seater is actually a variation of the city car designed by McLaren F1 designer Gordon Murray. The car is based the T.25, which uses Murray’s novel iStream production process, and this particular version, built in partnership with Shell, is called the Project M.
Why Doesn&apos;t Anyone Want To Build Gordon Murray&apos;s City Car? The reason Shell is involved is because the car is a test bed of how lubrication technologies can dramatically improve engine efficiency. As you may recall, friction is a good servant and a cruel master, like say, water or fire or maybe a dragon. It’s great for grip between a road and tire, but inside an engine it causes heat, wear, and all manner of inefficiencies. The car uses a 660cc Mitsubishi engine from one of their Kei cars, and makes 47 horsepower. In a 1,100 pound car, it actually feels pretty kicky. The entire innards of the engine was reworked, including the application of special low-friction coatings, and modifications to allow the engine to use an absurdly thin grade of oil. You could build and drive the Shell Concept Car for more than 100,000km and still use less energy than it takes to manufacture and deliver a typical SUV available in the UK into a showroom. In the formal New European Driving Cycle (NEDC) fuel-efficiency test, the Shell Concept Car produced lower CO2 emissions than both a typical petrol-powered city car (28%) and a hybrid car (32%). That’s impressive. From my perspective, though, it was a strange and exciting little microcar with an F1-style center seat, and they let me drive it around, indoors. Check out my video above to see how it went. Even in that little area, it proved to be an engaging little thing to drive. Getting in via the canopy door is, as every canopy door is, a blast. The seating position allows for great visibility and balance, and, as you’d expect from something the size of a go-kart, the thing handles like a go-kart. It’s a blast. I would like to try it on a real road, but I suspect that something like this would make either a commute to work or an autocross a pretty memorable time. Shell wasn’t committing to any plans about the future of these new coatings and lubricants for mainstream cars, at least not yet. To implement them would require changes to engines as well—it’s not a pour-in solution—but it’s good to see that improvements to the internal combustion engine’s efficiency aren’t completely being ignored in the face of the possibility of the looming dominance of electrification. Also, it was just fun.